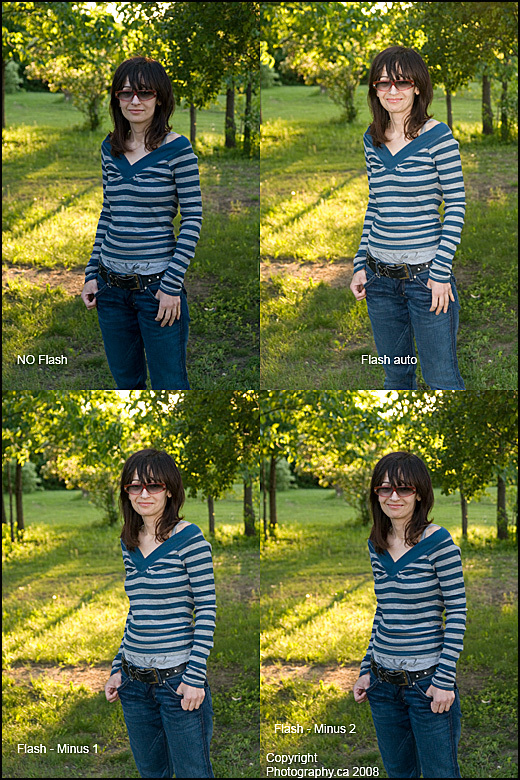 The images below (done really quickly with almost no post pro­cess­ing) clearly show the dif­fer­ences you can obtain using back­light­ing and flash at dif­fer­ent set­tings. Per­son­ally I like the Minus 2 shot the best. You best see the dif­fer­ences in flash out­put by look­ing at the face. Thanks as always to Cindy, Jason and Alex Wil­son for recent com­ments and sug­ges­tions. We LOVE com­ments and sug­ges­tions so please send more. I think the No Flash and the Flash –2 was nice, cause the lat­ter ones looks like the sub­ject was thinner.